March 14, 1767: Philip Ludwell III, the first Orthodox convert in American history, died in London. Decades earlier, in 1738, Ludwell had joined the Orthodox Church in London. He was just 22 at the time, and was a rising star in the Virginia aristocracy. Remarkably, the Russian Holy Synod gave him permission to bring a portion of the Eucharist back to Virginia. In 1762, Ludwell brought his three daughters to England to be received into the Church as well. Of course, we would know none of this were it not for the exceptional research and writing done by Nicholas Chapman, whose articles we’re proud to feature here at OrthodoxHistory.org. Click here to read Nicholas’ first article on Ludwell, and here to read about Ludwell’s landmark translation of an Orthodox catechism. And if you find Ludwell as fascinating as I do, I would highly recommend that you invest $4.95 to download Nicholas Chapman’s recent lecture on Ludwell. (And for $9.95, you get a CD of the lecture, a copy of Ludwell’s portrait, and the Ludwell family book plate.) I rarely encourage our readers to buy stuff, but trust me: this is worth it. March 14, 1853: Chronologically, after Ludwell, the most important American Orthodox convert has to be St. Alexis Toth, who was born in the Austro-Hungarian Empire 159 years ago this week (most of my sources say March 14, but Wikipedia has his birthday as March 18). Originally a Greek Catholic (“Uniate”) priest, Toth was assigned to serve a Carpatho-Rusyn parish in Minneapolis in 1889. But the local Roman Catholic archbishop didn’t want Toth’s “kind” — that is, Greek Catholics — in his diocese, and the two men clashed immediately. In 1891, Toth and his Minneapolis congregation joined the Russian Orthodox Church. 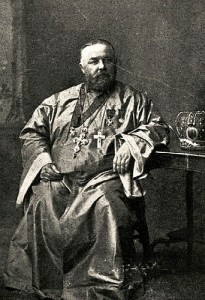 Dozens and dozens of Uniate parishes followed suit over the next two decades, and Toth was one of the chief advocates of Uniate conversion to Orthodoxy. He died in 1909 and was canonized by the OCA in 1994. March 13, 1868: Fr. Nicholas Kovrigin was sent on a pastoral visit to San Francisco, establishing the first foothold of the Russian Church in the contiguous United States. It all started back in the 1850s, when San Francisco’s growing Orthodox community organized into a mutual aid society. In the early 1860s, Russian ships visited the area, and some local Orthodox children — including the future Fr. Sebastian Dabovich — were baptized by a Russian navy chaplain. But there wasn’t a Russian parish until Kovrigin came along later in the decade. His visit was precipitated by the arrival, late in 1867, of the renegade Ukrainian priest Agapius Honcharenko, who moved to the Bay Area and tried to start some kind of hybrid Protestant/Orthodox parish. The Orthodox people seem to have realized that they needed to get an actual, legitimate Orthodox priest in their city, so they sent a formal request to the bishop in Alaska, who responded by sending Kovrigin for a visit. Initially, it was just that — a visit — but later in 1868, Kovrigin was formally assigned to be the pastor of a new parish in San Francisco. Unfortunately, Kovrigin seems not to have been made of the strongest moral fiber, and he ran into all sorts of trouble, ultimately being suspected of foul play in the death of his superior, cathedral dean Fr. Paul Kedrolivansky. Kovrigin was finally sent away in 1879, by the newly arrived Bishop Nestor Zass. On a more positive note, despite many trials and tribulations (and name changes), the San Francisco parish has survived to this day, and is now Holy Trinity, a cathedral of the OCA. March 15, 1896: Archimandrite Theoclitos Triantafilides celebrated the first Divine Liturgy in Galveston, Texas. I’ve written about Fr. Theoclitos recently: he was one of only three Greek priests to serve under the Russian Mission. Previously, he had been the tutor to the future king of Greece and the future Tsar Nicholas II of Russia. His Galveston parish was multiethnic, composed of Serbs, Greeks, Syrians, Russians, Copts, and American converts. To this day, his old parish of Saints Constantine and Helen venerates him as a holy man. 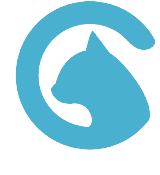 To learn more about Fr. Theoclitos, read this article by Mimo Milosevich. 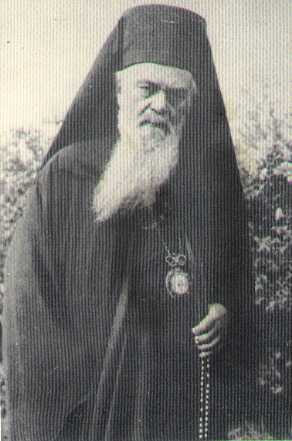 March 15, 1898: The future Antiochian Metropolitan Antony Bashir was born in Douma, in what was then the Ottoman Empire and what is now Lebanon. Bashir led the Antiochian Archdiocese of New York from 1936 until his death in 1966. This was the era of the “New York-Toledo” schism, when the Antiochians in America were divided into competing archdioceses (one based in New York and the other in Toledo, Ohio). Bashir was a major proponent of pan-Orthodox cooperation and the proliferation of English in church services. March 13, 1904: Archimandrite Raphael Hawaweeny was consecrated to the episcopacy by Archbishop Tikhon Bellavin and Bishop Innocent Pustynsky. This was the first episcopal consecration in American Orthodox history. Technically, St. Raphael was a vicar bishop under St. Tikhon, the Russian Archbishop of North America, and St. Raphael’s “diocese” was actually a vicariate for Syro-Arabs. Reality was considerably more complicated, and St. Raphael basically functioned as a mostly independent diocesan bishop with ties to both the Russians and the Patriarchate of Antioch. (As he put it, his diocese was a diocese of Antioch, “notwithstanding its nominal allegiance to the Russian Holy Synod.”) He served as bishop until his death in 1915. March 12, 1914: Fr. Alexander Hotovitzky, dean of St. Nicholas Russian Orthodox Cathedral in New York, returned to Russia after nearly two decades of service in America. He went on to suffer under the Communists, died a martyr’s death, and has since been canonized a saint. March 18, 1956: The exiled Serbian bishop Nicholai Velimirovich died at St. Tikhon’s Monastery in South Canaan, Pennsylvania. He had first come to America in the 1910s, as a representative of the Serbian Church. After World War II, Bishop Nicholai returned to the United States as a refugee, and he went on to teach at several Orthodox seminaries in the US. I feel like I should have a lot to say about Bishop Nicholai — who, after all, was canonized in 2003 and is famous for his prolific writings (most notably the Prologue from Ochrid), but to be honest, I don’t really know all that much about the man. There are a couple of informative biographical articles online, but I should note that both are written from a somewhat hagiographic (as opposed to a strictly historical) perspective. Click here for one published in The Orthodox Word, and click here for one from the periodical Orthodox America. March 16, 1960: The Standing Conference of Canonical Orthodox Bishops in the Americas — better known simply as SCOBA — held its first meeting. SCOBA arose from the ashes of the “Federation,” a 1940s attempt to foster pan-Orthodox cooperation in America. And while many initially thought that SCOBA might lead to the unification of the various jurisdictions, that obviously never happened. In 2010, SCOBA was disbanded and replaced by the Assembly of Bishops. The two organizations are different in many ways, but two are of particular note: (1) SCOBA included on the heads of the jurisdictions, while the Assembly includes every active, canonical bishop in America, and (2) the “Mother Churches” tolerated SCOBA, but the same Mother Churches actually created the Assembly. Along the same lines, SCOBA was a voluntary association, whereas the Assembly is an official ecclesiastical organization with a clear mandate from the Mother Churches. I realize that I didn’t really say much about the first SCOBA meeting, but that’s a story for another day. March 13, 1965: On the very same day, both Albanian Bishop Theophan Noli and Greek Bishop Germanos Liamadis died. As far as I know, this was the only instance of two American Orthodox bishops dying on the same date. March 18, 1981: OCA Metropolitan Ireney Bekish died. He had been the Metropolia/OCA primate from 1965 until his retirement in 1977 — so, the period when the OCA received its Tomos of Autocephaly and established its current identity — but I’ve never heard anyone talk of him as a major historical figure. Nobody talks about the era of Ireney, because it really was the era of Fr. Alexander Schmemann, who effectively led the OCA during Ireney’s entire episcopate. March 16, 2008: ROCOR’s First Hierarch, the revered Metropolitan Laurus Skurla, died, shortly after helping to accomplish the reunion of ROCOR with the Moscow Patriarchate. Met Laurus had led ROCOR for seven years, and while he is most remembered for that tenure, the bulk of his hierarchical career was spent as abbot of Holy Trinity Monastery in Jordanville, New York. March 13, 2011: Metropolitan Nicholas Smisko of the American Carpatho-Russian Orthodox Diocese (ACROD) died of cancer after more than a quarter-century as primate of ACROD. A year later, his position has yet to be filled. ACROD has established a memorial web page for Met Nicholas; click here to view it. Prev : A Transatlantic Transylvanian: The First Orthodox Priest in the Americas?